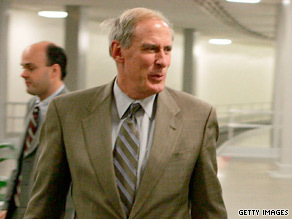 Republican Dan Coats has been the target of political attacks. Washington (CNN) – Since Republican Dan Coats entered the Indiana Senate race earlier this month, Democrats have unleashed a torrent of opposition research against the former senator, making hay of lobbyist work and a video showing Coats calling North Carolina "a better place" than Indiana. But before Coats can take on Democrat Evan Bayh this fall, the former senator must survive a Republican primary - and his two GOP opponents are now raising doubts about Coats' voting record while in the Senate. His Republican rivals – former Rep. John Hostettler and state Sen. Marlin Stutzman – are calling attention to Coats' votes on judicial confirmations and gun control, while he served in the Senate from 1989 to 1999. "I guess I would consider him a conservative, but there are votes that people are raising their eyebrows over and saying, 'Is this the conservative we are looking for?," Stutzman told CNN. Stutzman said Coats cast several votes "against" the Second Amendment, including one in favor of a tough 1991 crime bill that banned several types of semi-automatic weapons. He was also one of seven Republicans to vote in favor of the so-called "Brady Bill" in 1993, which instituted background checks for firearm purchases. Hostettler promised to highlight Coats' vote to confirm Ruth Bader Ginsburg to the Supreme Court in 1993 (even though only three senators opposed her nomination). Ginsburg replaced retiring conservative justice Byron White. "Sen. Coats voted to replace one of the most legendary pro-life voices with probably the most pro abortion nominee ever presented to the Senate," Hostettler said. "You can't be voting to replace pro-life votes with pro-abortion votes." Hostettler said his campaign will also emphasize Coats' vote to confirm Sonia Sotomayor to the 2nd Circuit Court of Appeals in 1998. A spokesman for Coats did not respond to a request to comment on his Senate votes. Both GOP candidates groused about the National Republican Senatorial Committee's endorsement of Coats. "The Tea Party movement is incensed that Washington, D.C. is just going to name an heir apparent," Hostetler told CNN. "The folks in Washington, D.C. want to get a big name and someone that they believe can raise the money to beat Evan Bayh. Washington, D.C. doesn't get it and unfortunately my party doesn't get it." Stutzman said Hoosiers are "frustrated" with Coats "trying to come back and run now after he has been in Washington and served as a lobbyist." "Washington is trying to cram down a health care bill on us, cap and trade, card check, and now it's the same attitude for Dan Coats and the NRSC," Stutzman said. UPDATE: The NRSC insists they aren't trying to coronate Coats as the GOP nominee. "While the NRSC agrees with a number of Hoosier State officials such as Congressman Mike Pence and Mark Souder that Senator Coats would be a strong candidate, we also recognize that it's the voters of Indiana who will choose the nominee and their next Senator," said NRSC spokesman Brian Walsh. "Our focus is on holding Evan Bayh accountable for his record which includes providing the 60th vote for the boondoggle stimulus and the President's health care bill." UPDATE 2: Coats's spokesman Kevin Kellems brushed off the shots at Coats. "Dan Coats' record as a solid conservative who handily won two statewide races for the U.S. Senate is well established and widely recognized throughout Indiana; suggestions to the contrary are unfounded and in some cases politically motivated," Kellems said in an e-mail to CNN. Yeah, Background checks for arms purchases was such terrible idea. When did "conservative" start to mean "absolutely crazy"? Roaches often eat each other as well. They have many things in common. As a Hoosier, a conservative, and a father of four kids ... I'd much prefer we not send a lobbyist from Washington to go up against Evan Bayh. They would both have the same baggage. Time to patch the hole in the ship, not re-arrange rusty deck chairs. His voteing record alone if you follow The Constitution, is reason enough to vote for John Hostettler and not Dan Coats or Evan Bayh. Dan Coats right up till he said he would run lived in another state and worked as a lobbiest at times. He has not even been able to vote in this State because he hasn't lived here. Evan Bayh look at his senate voteing record he votes with the democrates weither The constitution agrees with a bill or not. NOW Look at John Hostettlers 12 year voteing record in the House of Representatives. Conservative, Yes, follows The Constitution, Yes, follows the Republican party blindly, No, not if they are wrong. John Hostettler above anyone running for Senate in Indiana has showen he can and will do the best Job. Go to Johnhostettler.com to learn more. There will always be an "official Purity Test" for the republican party. Anyone think that someone elected should represent his state or district, or just vote like "the party" hacks tell him or her to. Sometime we need to challenge our elected officials to use their minds and their judgment rather than just repeat what they are told to. We need thoughtful people, not robots!" fear not his own party will unleash far worse than the democrats ever thought of. Once they back bite each other then they act like the opposition is the ones making all the attacks. I agree with Stutzman about Coats. The Republicans must want Bayh back in if they are promoting Coats. Stutzman would be a much stronger candidate. Boy this guy sounds really evil! I was just wondering, does the second amendment also guarantee the right to bear nuclear arms? I bet those socialist liberals think not.